TATS A KOOL CHALLENGE: Grandbaby! Remember my leprechaun Fionn.....he who is sitting at the top of my blog.....well he has decided to change his name....to Fergal!! The reason is that my daughter has just produced my first grandbaby...a beautiful little boy and she named him Fionn..'would you believe it' said my leprechaun who thought he had such a cool name.....but well he just doesn't want to have the same name as grandbaby.....much too confusing. Baby Fionn...pronounced Fyon as in yonder....was born on October 23rd weighing in at a healthy 8lb 5oz. Fionn Mac Cumhaill (Fyon Mc Cool) was a mythological Celtic warrior, a giant of a man, leader of the Fianna. There are many stories about Fionn, but my favorite one is how as a boy Fionn caught the salmon of knowledge. You can find the story here. Grandbaby Fionn is beautiful...yes I know all grandbabies are but.....he really is beautiful. Here he is 3 days old,so magnificently swaddled by his daddy. 4 days old with grandma practising nappy changing. 5 days old when he didn't want to go to sleep but to chat to grandma and grandpa who were in charge! His mum so hoped that he would be born before halloween ( he was 4 days early!) so that he could wear the lovely outfits he had been given! He was just 7 days old and didn't approve to much of the bib or the matching scary hat! but he loved the socks. 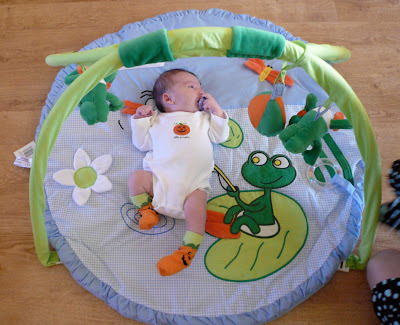 He had his first try out of his froggy play mat and he matched it so well. 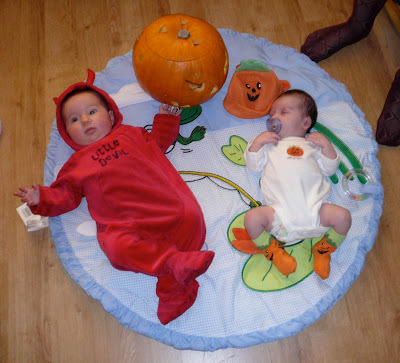 Just to show you how tiny he actually is, this is Fionn with his girlfriend Madie who is 3 months old! See his pumpkin hat! 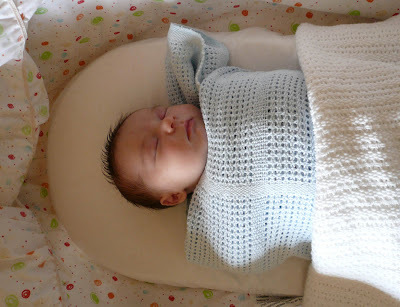 Well that was Fionn's first week that we got to share. 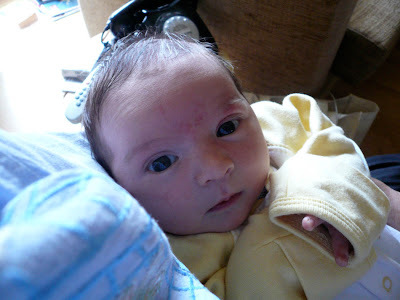 Not had much time for blogging and going back to see him again tomorrow, he will soon be a month old, how time flies. 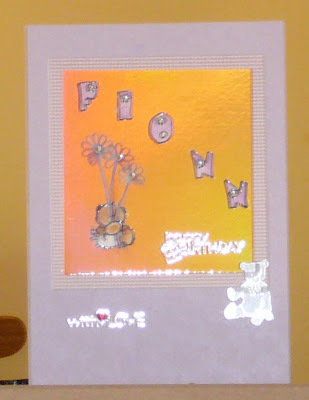 I guess I better add a tiny bit of tatting to this post...here is the card that i made for his Birthday.....it's more of that holographic card that looks so different from different angles. 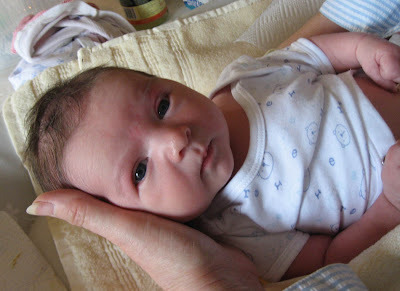 Fionn is a beautiful baby boy! Thanks for sharing such adorable pictures of him! He's so sweet looking! No wonder we haven't heard much from you lately; could this be the reason??? Ohh, he's a handsome fellow. Enjoy this special time! What a lovely baby boy! 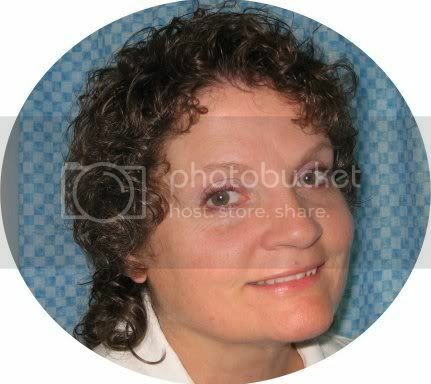 Thanks for sharing pictures! Thanks for sharing handsome Fionn with us. Have fun! Oh, what a pretty baby boy! Congrats, Grandma! Congratulations! I wondered why I wasn't seeing anything from you. Beautiful baby boy with tons of hair and I can actually see you in him! Congratulations to the parents and grandparents! The legend about the salmon of knowledge was wonderful, what a grand namesake Fionn has to live up to! What a beautiful baby boy and such a wonderful name. Congratulations, Grandma! I was wondering when we'd get to see pictures, thank you for sharing. Envy! He's lovely, I'm longing for a grandchild, but both daughters are somewhat recalcitrant, and Raph is only 11, so I can't ask him! Ahhhh, he's a charmer, he is. Lucky you to get to play with such a sweet little guy. Your Grandson is beautiful and looks so alert. I will be a grandma again having my first granddaughter. I can hardly wait. 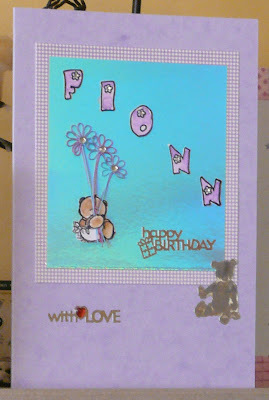 Fionn, what a great name!! He is a beautiful baby. Congratulations to all. Yeah he is worth the wait!! He lives a 4 hr drive away so wont see him as often as I would like. Just got back from a second visit and this time got to hold him a lot as his parents were ready to give him up a bit!! No 6. Sunburst and more talented friends.